Can't beat this price! Right now Walmart is offering this Ozark Trail Deluxe Adult Steel Frame Mesh Chair $9.00 - $11.90! Relax in comfort with the Ozark Trail Deluxe Adult Steel Frame Mesh Chair (Grey). It folds up, making it easy to store and transport. This Ozark Trail mesh chair comes with an integrated cup holder for your soda, water, juice or any other beverage. It is made with a strong fabric body and sturdy construction for long-lasting enjoyment. 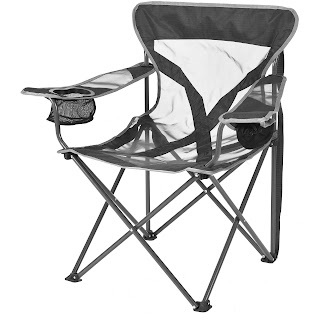 An included carrying bag makes it easy to bring this deluxe mesh chair along for camping, outdoor barbecues and more. It is available in your choice of assorted colors.